I recently ended up with an extra 2004 Topps Retired Hank Aaron autograph. Yep, I just recently landed this white whale of mine, and then funny enough, I was in the right place at the right time to snag another. Instead of selling the dupe for a substantial profit, I set out for a mega trade. 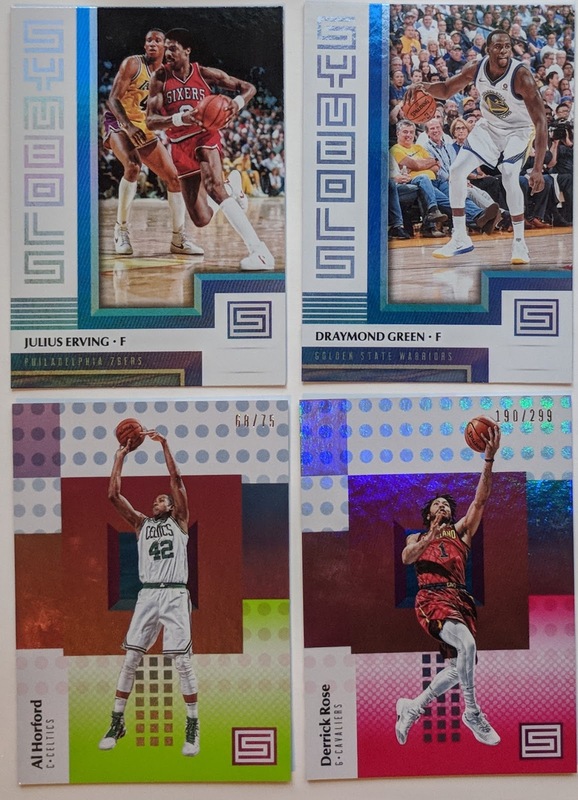 I had 3 big cards in mind owned by 3 trader buddies. 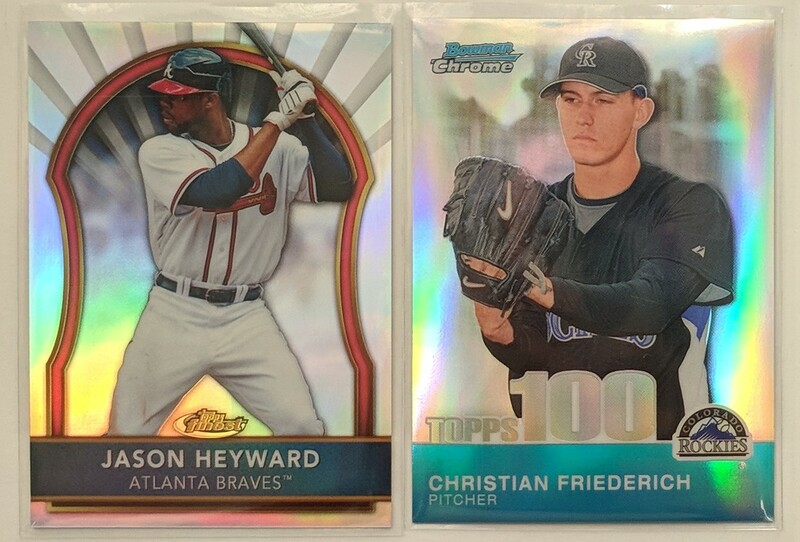 So I dug up cards to supplement the Hammer auto tailored to each trade prospect. 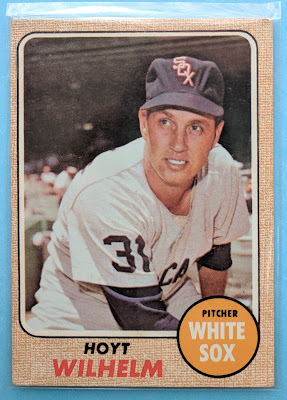 My #1 choice card was pulled a few years back by Tony Burbs, well-respected Cubs collector, so I gathered up some good Cubbies to back up Hank. If that didn't pan out for me, Card #2 on my list was Shoebox Shane's Mike Trout liquorfractor rookie. I didn't have high hopes for him being agreeable, but I would have swapped out the Cubs for some good Sox and hoped for the best. And if those all didn't work out, I'd field offers on the blog and Twitter, and if nothing seemed right, throw Hank on eBay. BOOM!!! Axl Rose auto from 2013 Topps Archives. This was a huge card I had been pining for for a long time. I knew Tony lucked into pulling it, his greatest pull, and I had hoped to one day be able to put together a strong enough offer for it. Very happy to have swung this mega trade! 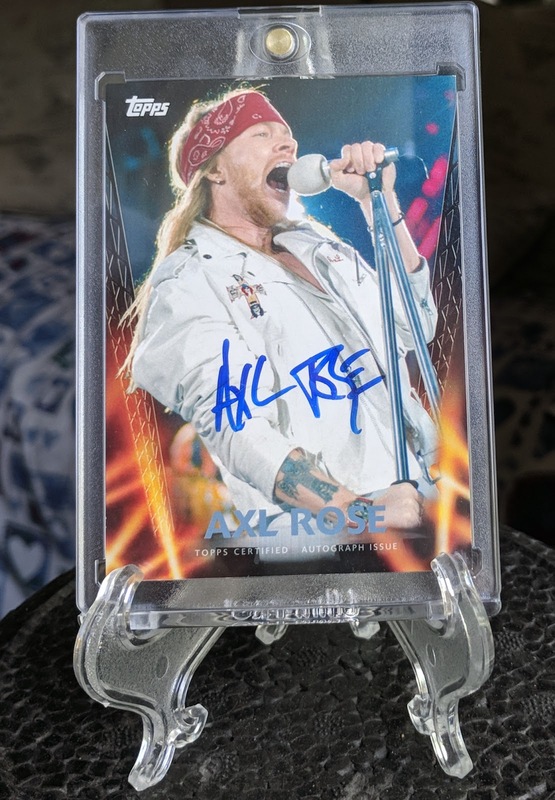 I've realized recently that Guns N' Roses is currently my favorite band, as you might've guessed with them frequently getting worked into my posts over the past few months. What can I say, they're just the band I most dig listening to these days. (I'm musing on typing up a post covering my favorite bands over the years.) 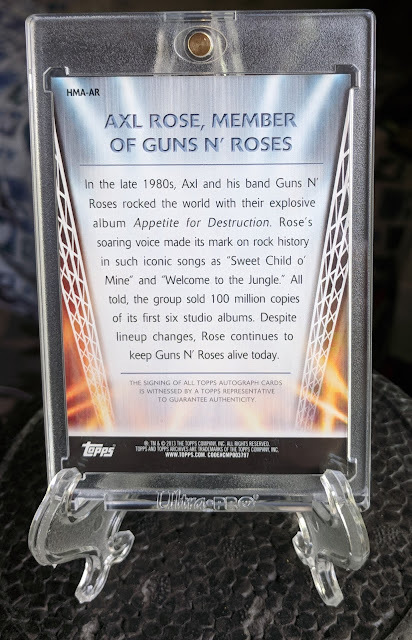 Appetite For Destruction was among the first few cassettes I ever bought for myself as a kid in the late 80s, so there's plenty of sentimental value for me there, too. In difficult times, I turn to the lyrics of W. Axl Rose, with his wisdom being a beacon steering me towards the right course of action. They've got dozens of songs I love deeply, though I might have to say my favorite song is "Locomotive". That's my jam, especially on a Friday afternoon when I get off work. If I were a professional baseball player, it'd be my walk-up music. 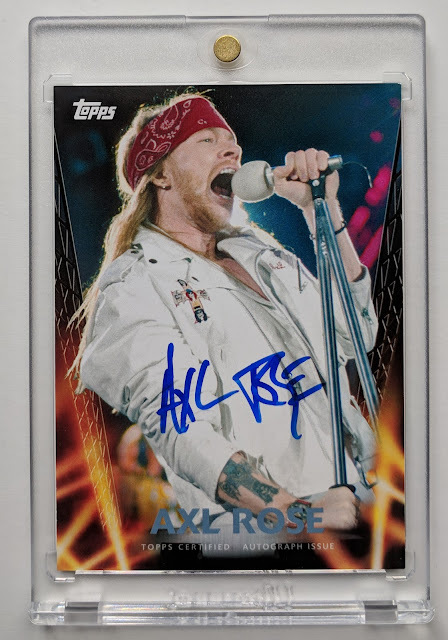 Anyways, back to the card.. Looks like Axl has two Topps certified autos on the market: this card from 2013 Archives, and a framed mini from 2013 Allen & Ginter. 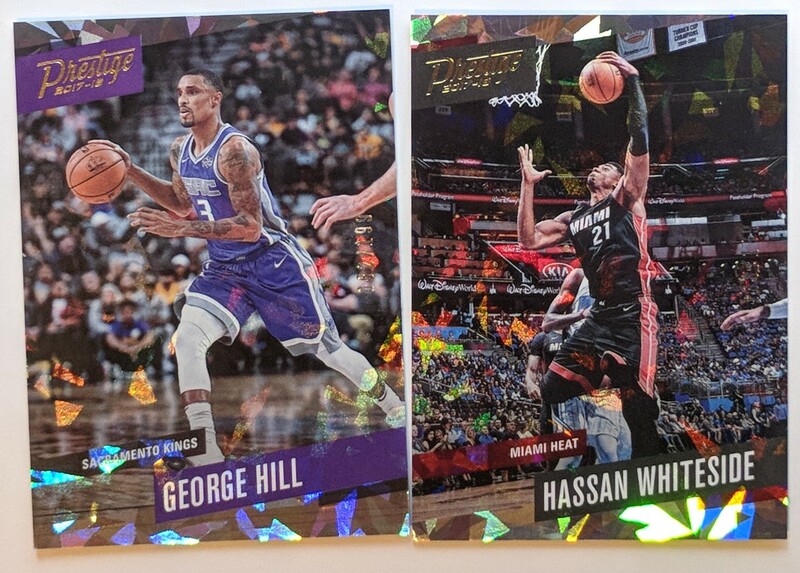 Both cards consistently sell on eBay for $300+. 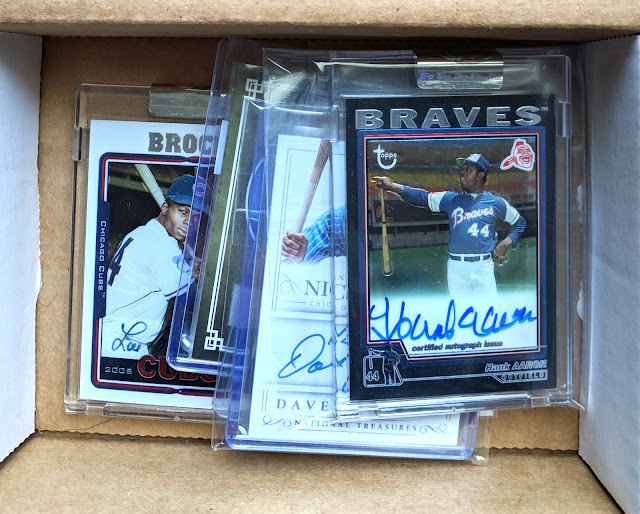 It would be reaching on my part, but certified autos of Clemente, Mantle, or Ted Williams would also have my interest, for sure. I guess that's sort of an Expensive White Whale list for me. I'll have to keep that handy in the event I end up with another really nice card to trade someday (or win the lottery or something). ** I hit Fuji with an alternate trade proposition for the Duncan, sans-Hank, but still with plenty of pop. He declined, which I totally respect, though it was an impressive lot, but he gave me some solid personal reasons for his inclination to retain the card, and it seems like the card has "untouchable" status for him, and would still be even if the Hank was part of the offer. 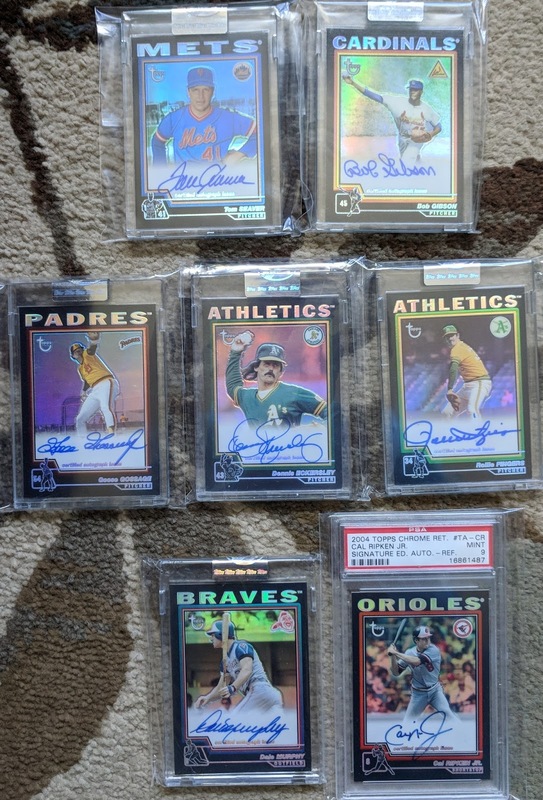 Anyways, I can't thank Tony enough for this successful mega-trade knocking off a dream card for me! 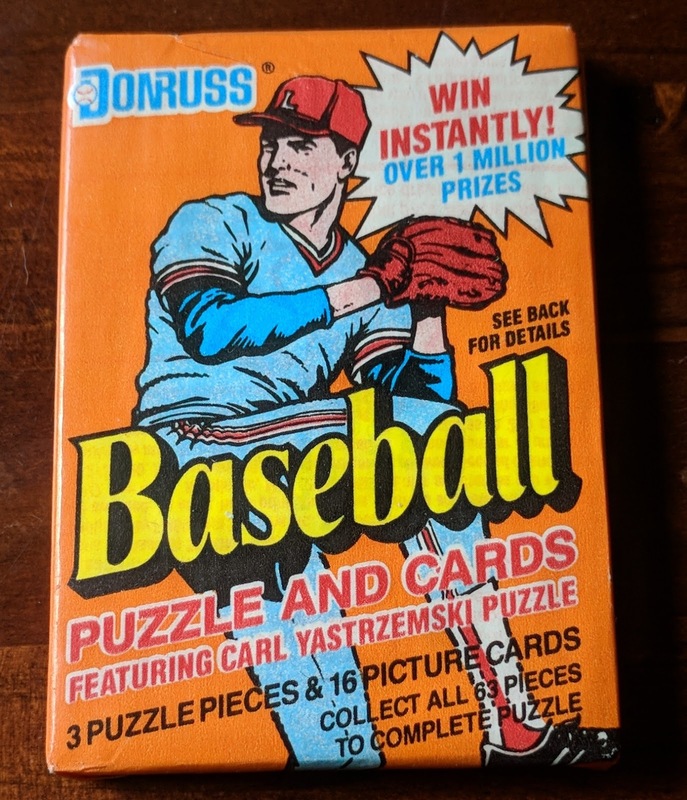 A pack rip of 1990 Donruss you WILL NOT BELIEVE!!! 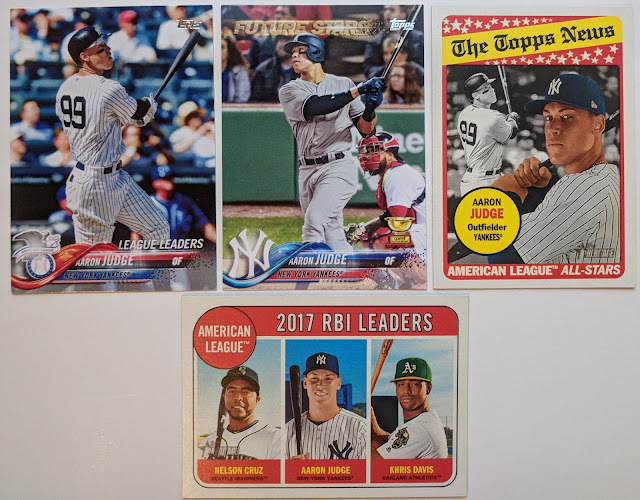 I've been watching a lot of pack-ripping on YouTube because I got in on a player-break for Gavin LaValley in 2018 Bowman. And all that crinkly foil sound of a ripped pack really gave me the urge to open a pack myself. Let's see what do I have on hand..
1990 Donruss.. sure, that'll do. Hey, that Dean Palmer rookie was a big deal at one time. Whoo.. PC hit with the Nolan special. While I'm pretty sure I've already got it, this pack-fresh pull might be an upgrade. Diamond Kings are always nice to spice up a pack. OH MAN.. I HIT IT BIG!!! Holy Crap! It's even a 1/1!!!!! BIG MONEY! $HOHEI!! eBay here I come!!! Easily $40k. 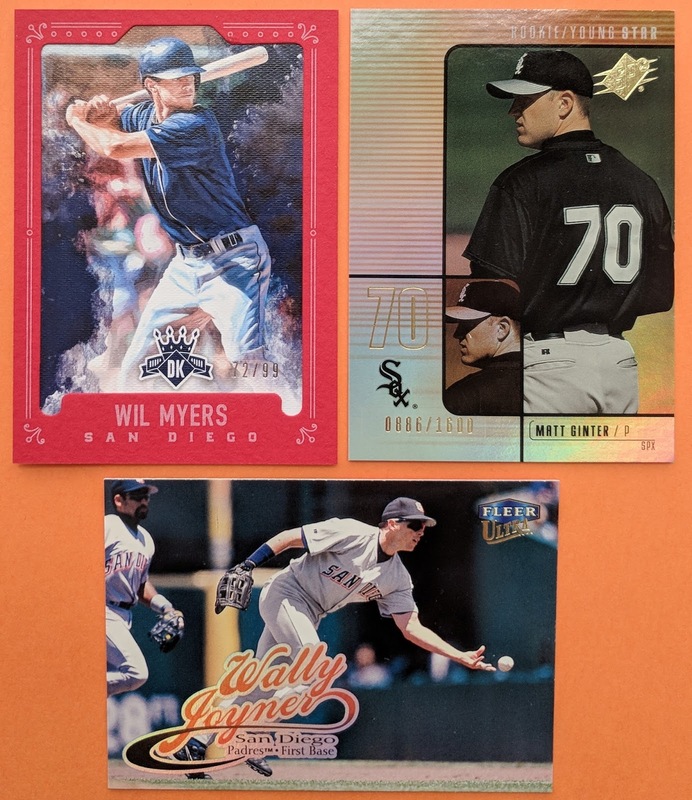 Man, that was the best pack of '90 Donruss EVER!!!!!!!!!!! I lucked into winning Sport Card Collectors' big Panini giveaway recently, and since he was sending me a package, we threw a little trade on top of it, too. Everybody stand up. Here comes Aaron. Oh wait, I mean, All rise. Here comes the Judge. Some artistic inserts of Goldy. 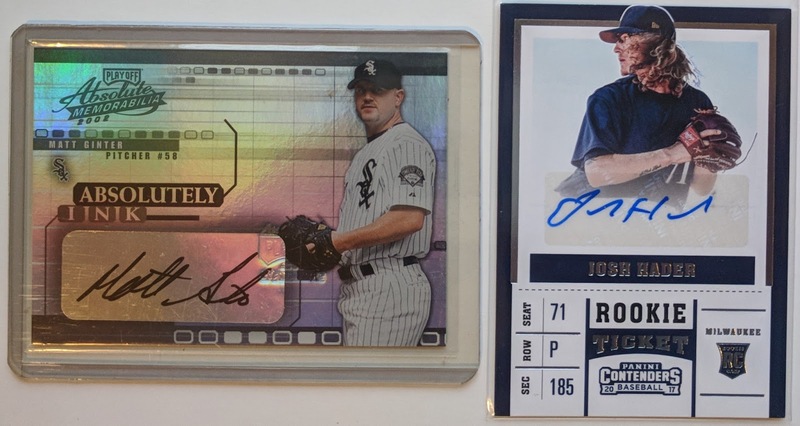 And a couple autos, including Matt Ginter and Josh Hader. Hader's been excellent for the Brewers out of the pen so far this year. Now we're getting into the football portion of my contest winnings. 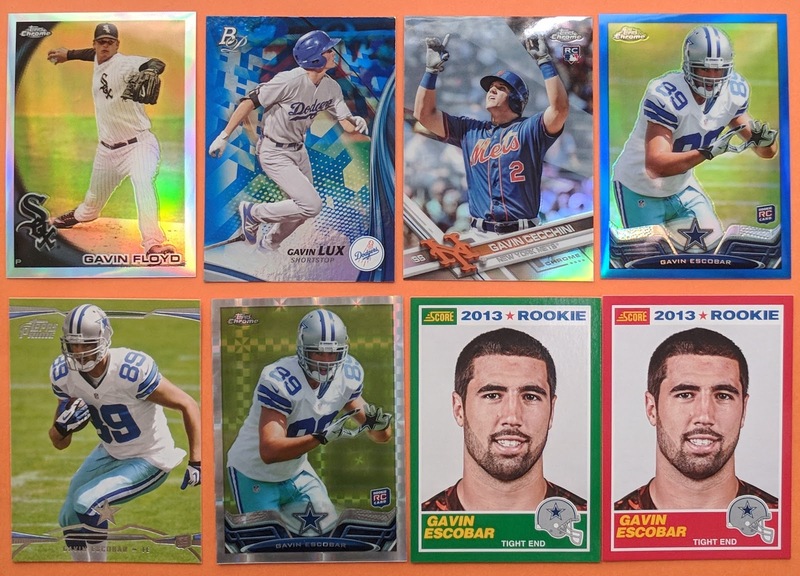 I don't collect very many football players, so not much of the prize package fits my personal collection, but I was still very happy to boost my trade fodder. 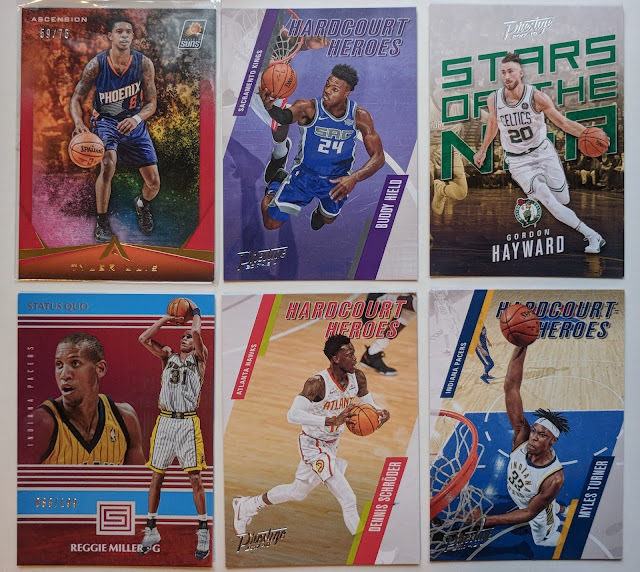 Most of the below cards are available for trade, so just get in touch if you'd like to see about working something out for any of these. This is a great looking card of 49ers RB Carlos Hyde. 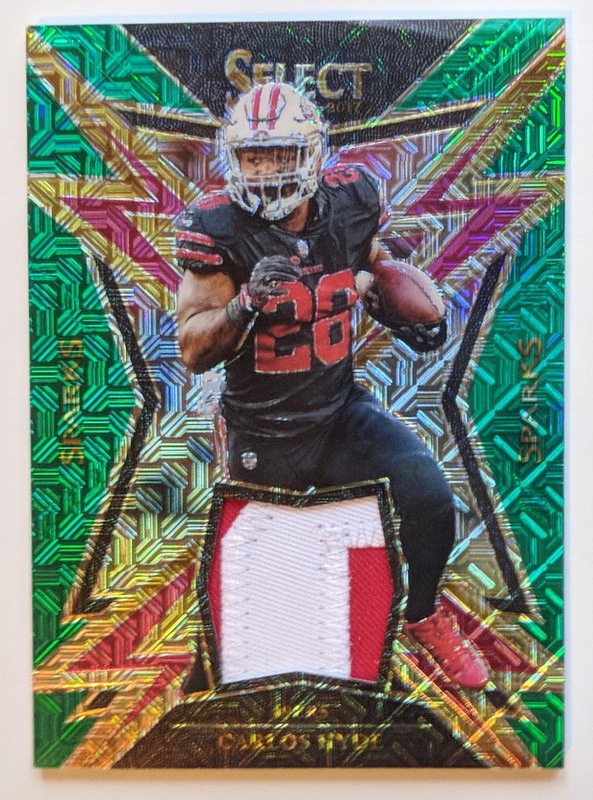 Super shiny with a nice patch. 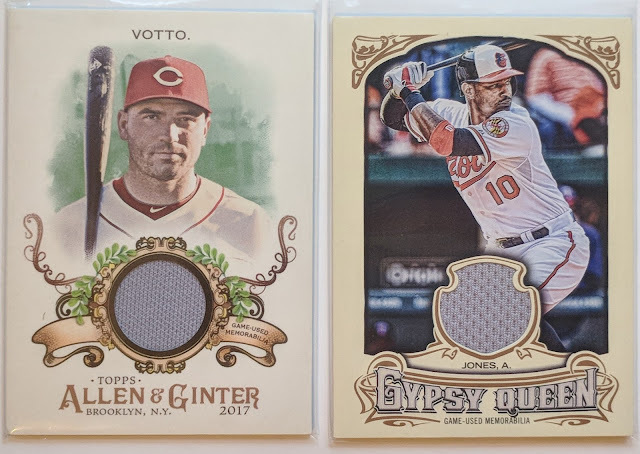 Numbered 2/5 on the back! Looks like he recently signed a big contract with the Browns. Hopefully he and new #1 pick Baker Mayfield can team up to help lift Cleveland out of the toilet. 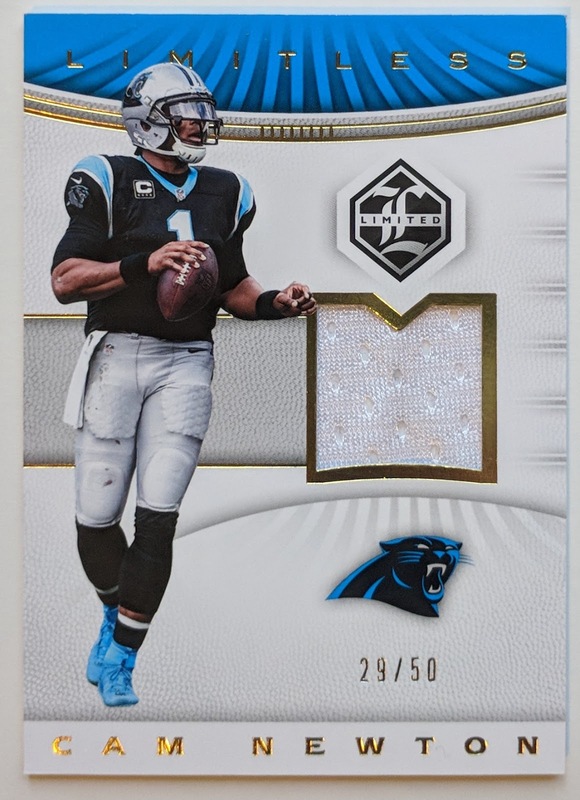 Hey, Cam Newton is a name I know without having to look him up. So that's cool. Some football autos. If you can't read it, the redemption is for Latavius Murray, a running back who started his NFL career on the Raiders and is currently with the Vikings. 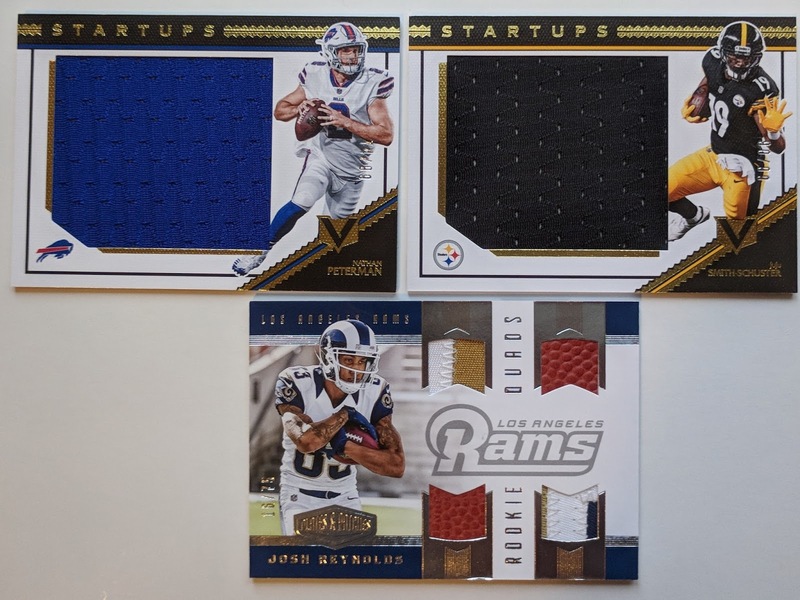 More Steelers.. always nice to get for fodder with my Pittsburgh-collecting trader buddies. Now we head to the basketball portion of the prize package, highlighted by a couple autos. Hey, Dr. J is a dude I collect, so there's a keeper for me. A lot of inserts/parallels including some good names. 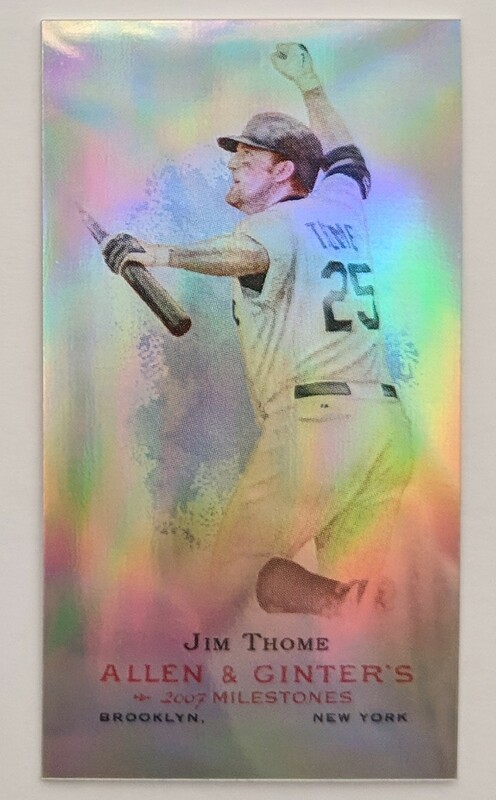 And we'll wrap things up with this shiny pair of /199 cards. Thanks again, SCC! Fun package of cards, for sure. I've got that good problem right now where I'm getting overwhelmed by incoming cards from trades and purchases, fighting for any available table space on my card sorting table. Let's bust out a couple big ones. First up is a trade with Turrdog. Fresh off big help with '84 and '85 Donruss in our previous swap, he hit me with another nice box of cards. I needed this '68 Topps Hoyt Wilhelm! A couple of my favorite Pirates old-timers. 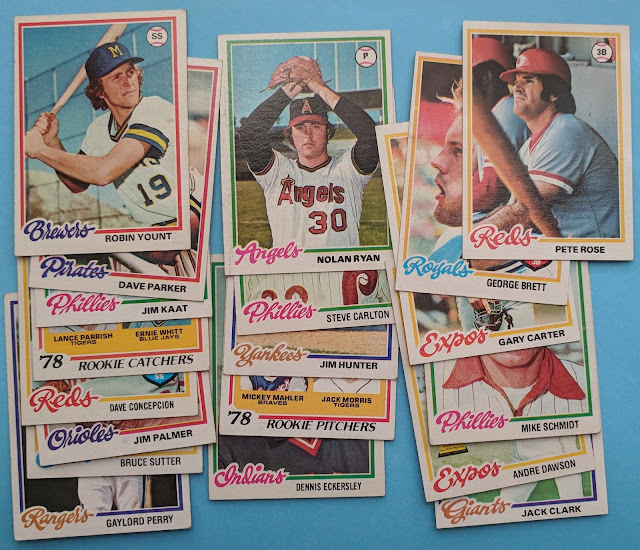 I'm gonna get serious about 1978 Topps here soon, and this awesome lot of big names gets much of the heavy lifting out of the way! 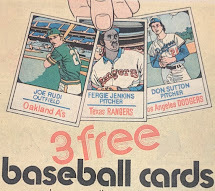 But the real heft of the package was a boatload of 1982 Topps. Really took that setbuild to the next level, with just a reasonable number of holes left to fill. Expect me to get a wantlist up soon. Huge thanks for another great trade, Jeffery! And now here's a surprise package from my bud Dennis at Too Many Verlanders. 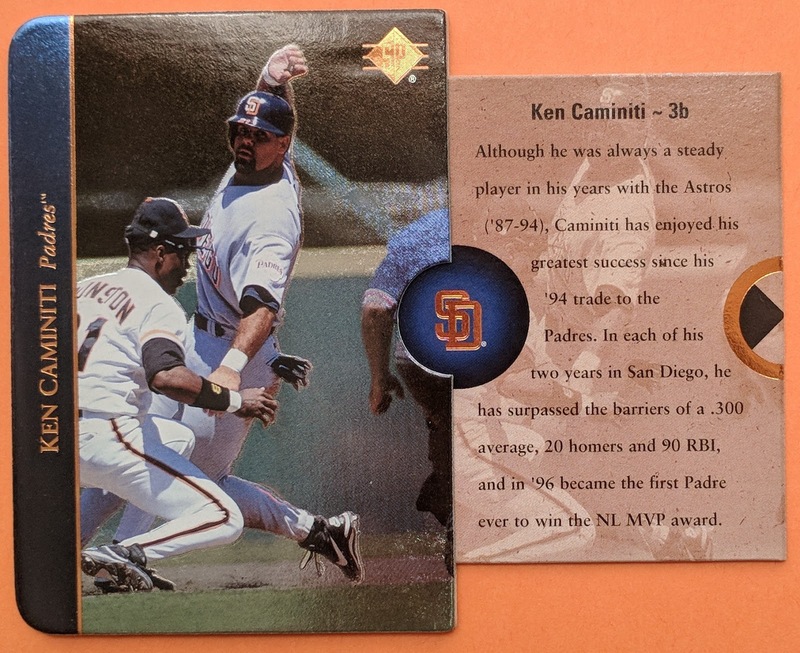 Always love adding new Caminiti cards to the PC. This one's a zany peek-a-boo pouch where you pull to extend out a little info card. Numbered cards of Wil Myers and my birthday twin Matt Ginter, plus a nice looking Wally. 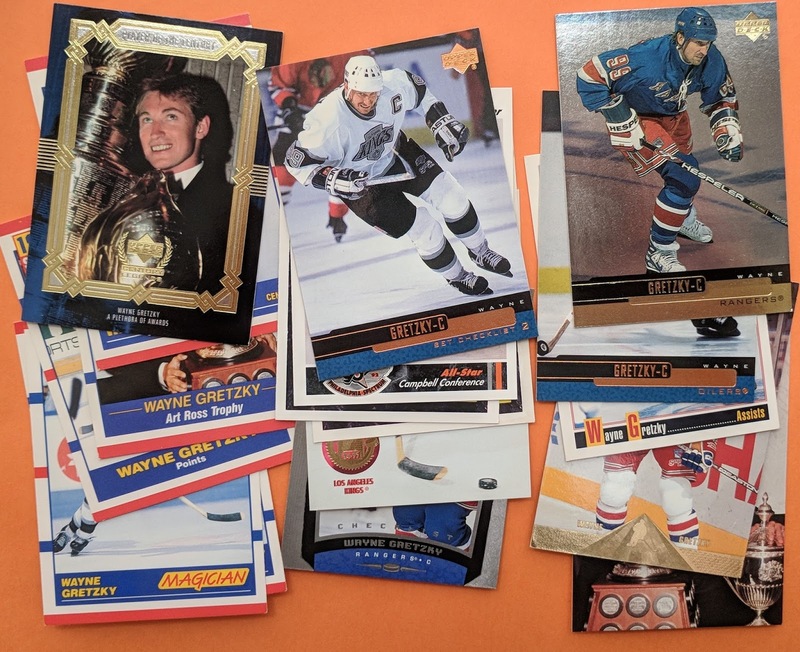 I think Dennis just tripled my Gretzky PC! 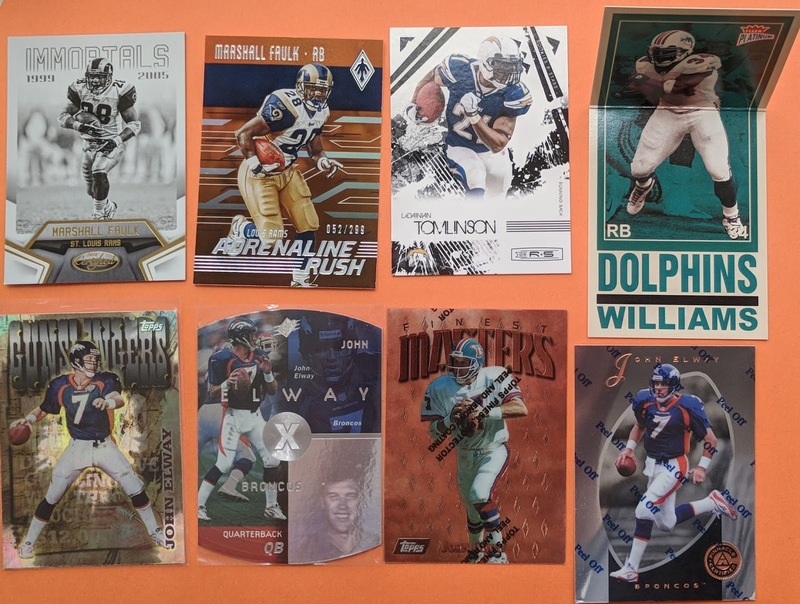 Some quality football cards in the mix as well. 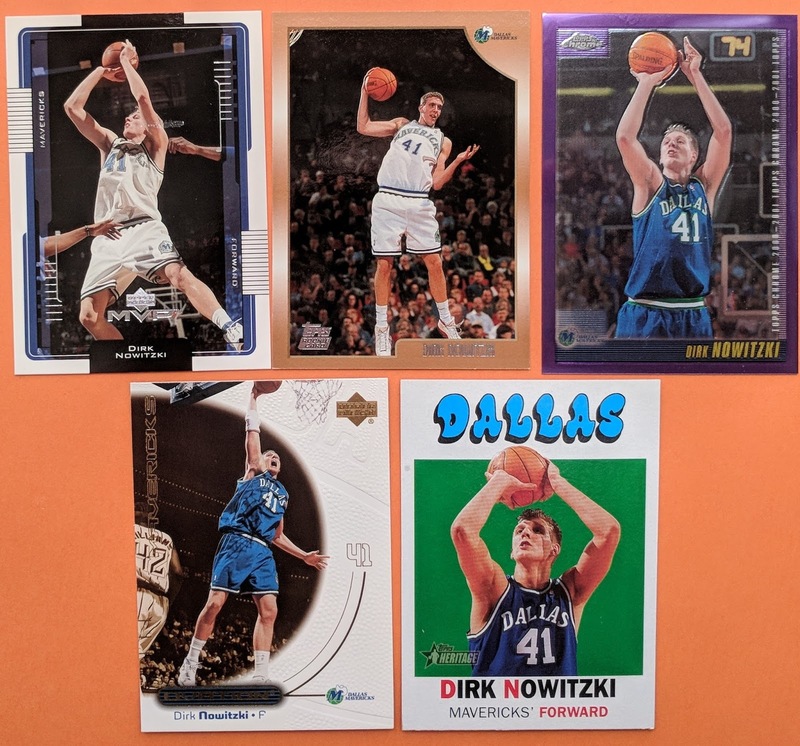 I recently snuck Dirk Nowitzki onto the short list of "basketball players I collect" and Dennis lent a hand getting that new PC off the ground. 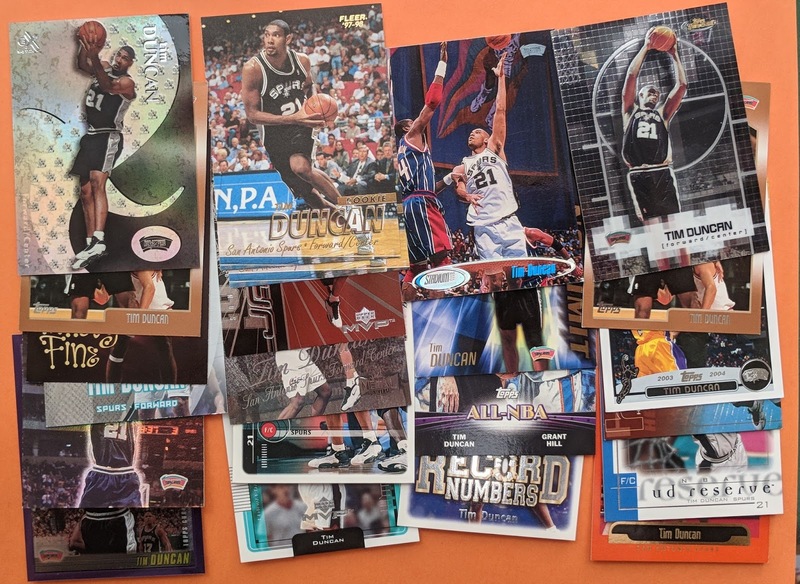 And a terrific Tim Duncan lot! Closing out with a sweet bunch of Gavins. Very nice. Gavin Escobar has bounced around a lot the past couple years, recently signing with the Dolphins. I hope he can get on track in Miami this upcoming season. 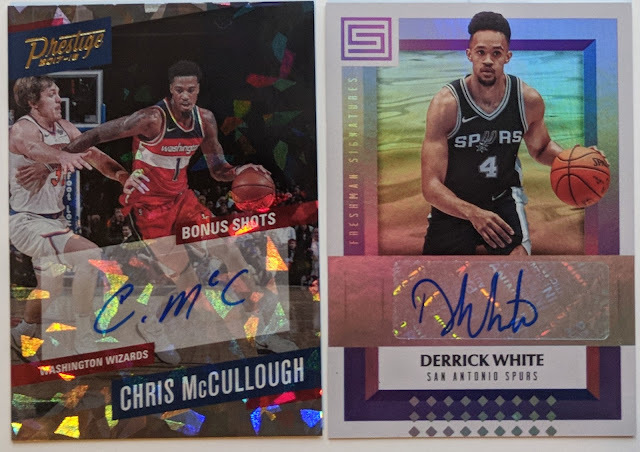 This post wraps up the highlights from my latest COMC order. It also completes the series of posts over the past several weeks titled after Appetite For Destruction songs. 1. "Welcome to the Jungle"
4. "Out ta Get Me"
9. "Sweet Child o' Mine"
Maybe I overestimated the Venn diagram intersection of card collectors and Guns N' Roses fans, but whatever, I'm a big fan of the band and I'll likely continue my "Guns N' Randoms" posts with the Lies album up next. Why not, right? 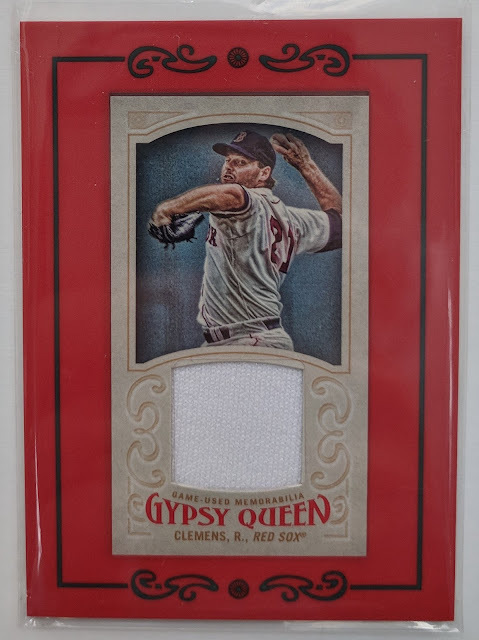 Gotta admit I added this card to my COMC inventory for the sole reason of having a hit card to cleverly include in my "Rocket Queen" post. A "Rocket" Roger Clemens Gypsy Queen relic did the trick. 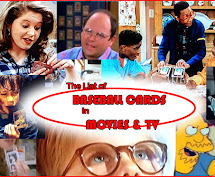 But I also kinda collect him since he's a member of the Springfield Nine (I collect any baseball player who guested on The Simpsons), so it'll have a home in that PC, not just used as a prop for a blog post. 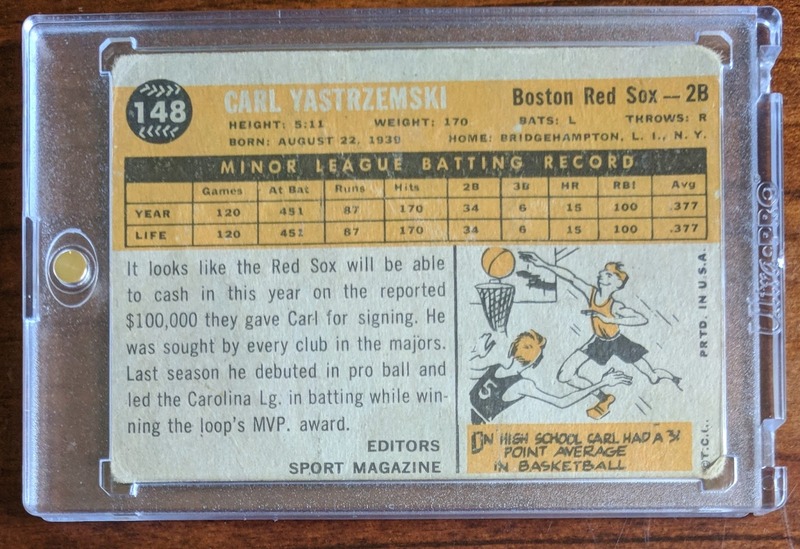 I saw one of these on Sport Card Collectors and had to grab one for myself. 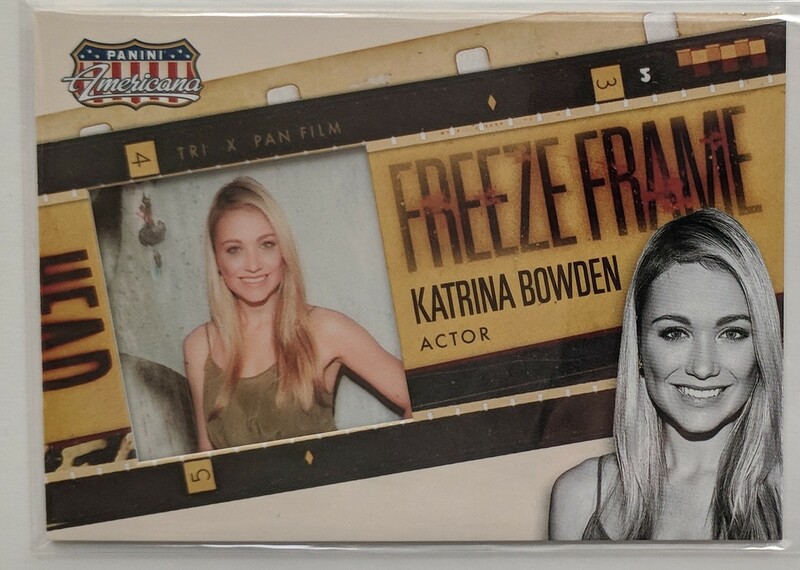 I'm a big fan of 30 Rock's Katrina Bowden, and this is my second card of hers after an auto I got a couple years ago. It's got a neat "film strip" thing going on with the acetate inset picture. 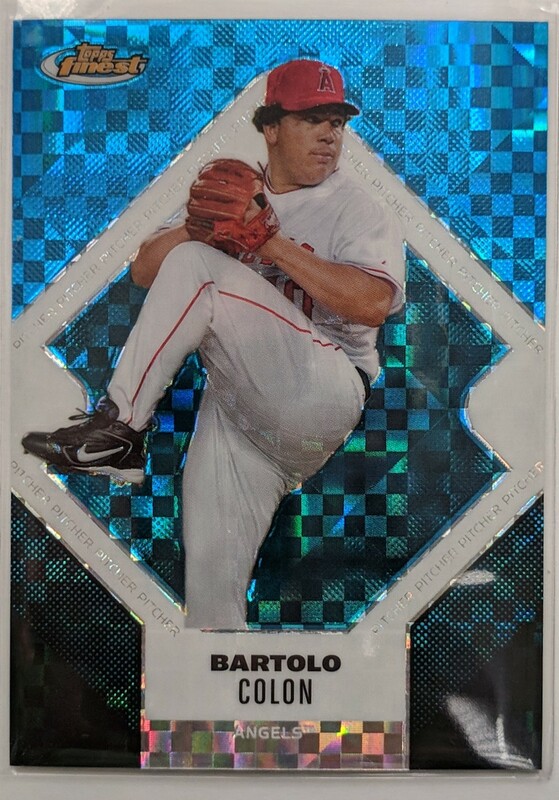 Sometimes I search COMC for serial-numbered cards by lowest-price-first and look for anything cool/interesting/cheap, and that's how I ended up with this /150 Bartolo. 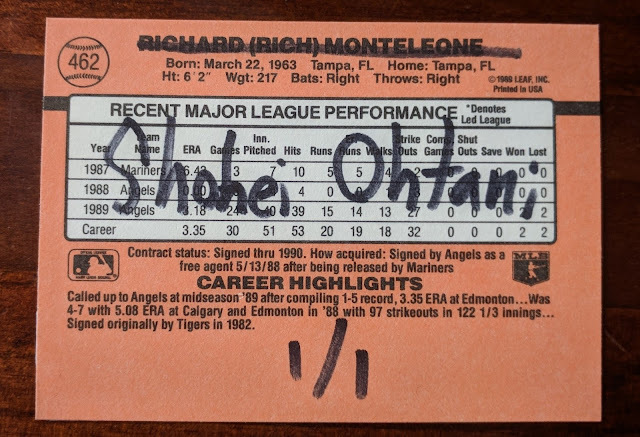 Pretty neat that the old guy had a no-hitter going deep into a game last week. 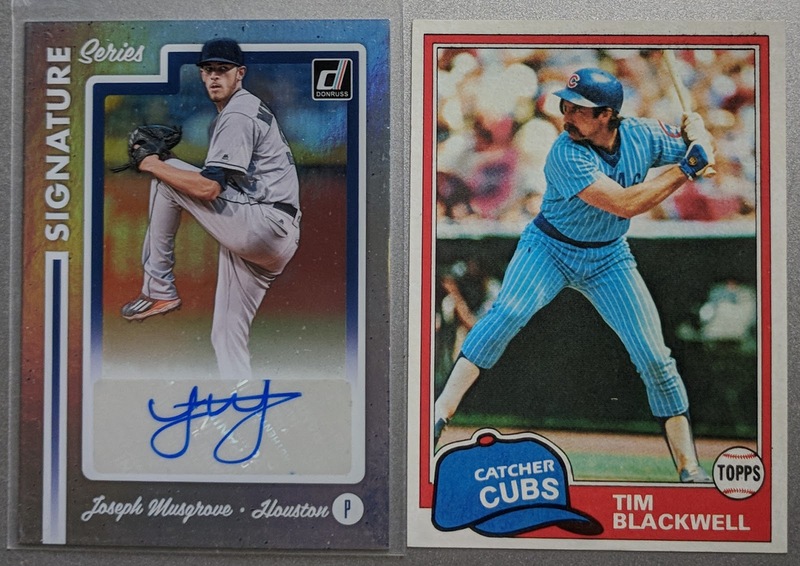 A couple more cheap numbered refractors I picked up. 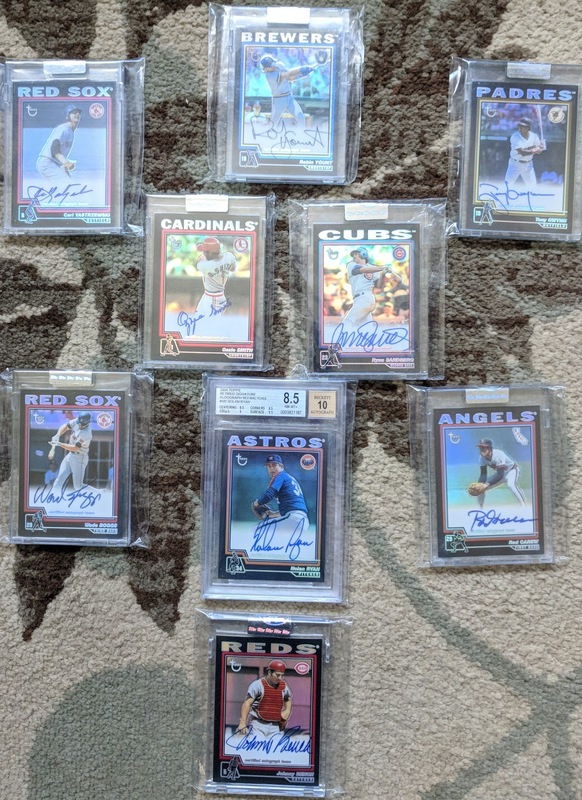 Looks like Heyward is having an ok 2018 so far. As for Christian Friedrich, I kinda liked him during his 2016 stint with the Padres, so that was enough for me to pull the trigger on this Bowman Chrome insert a few months ago, though I probably wouldn't today. He seems to be without a team this season. 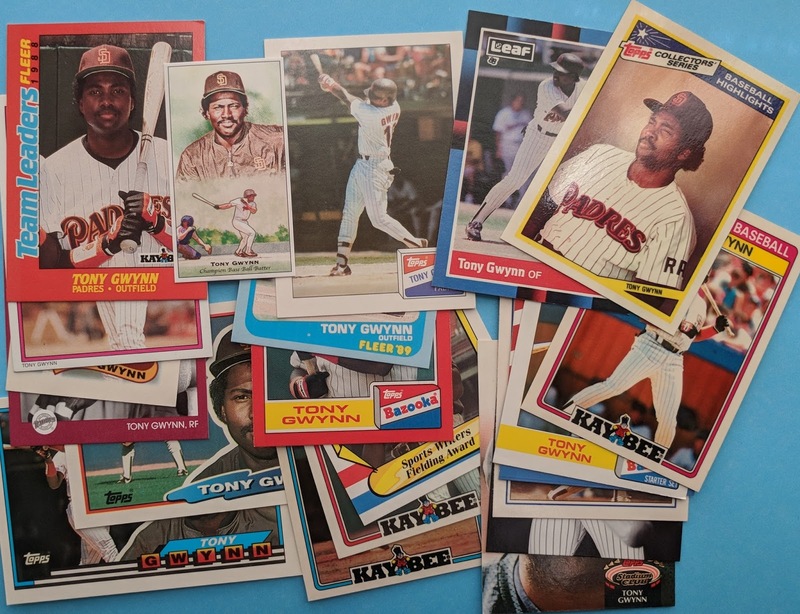 Another lowest-price-first search, but this time with Topps Throw-back Thursdays, the little online-only print-to-order sets they crank out on a regular basis. 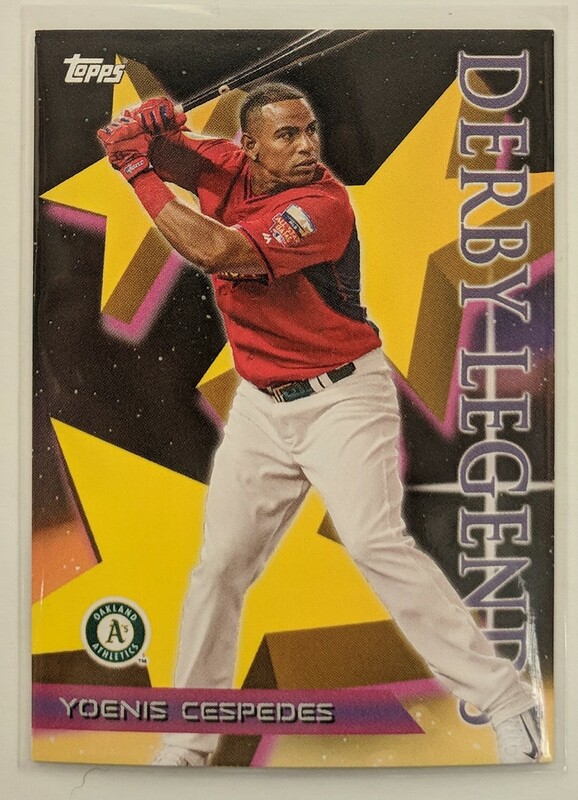 Grabbed this "1996 Star Power Design" (print run of 1118) to spice up my little Cespedes PC. A nice thing about these is they're on hearty Heritage-type stock. Finally, here's what might be my new favorite (non-framed) mini in my collection.. or at least in the top ten. It's a Chrome-ish Ginter refractor from eTopps. 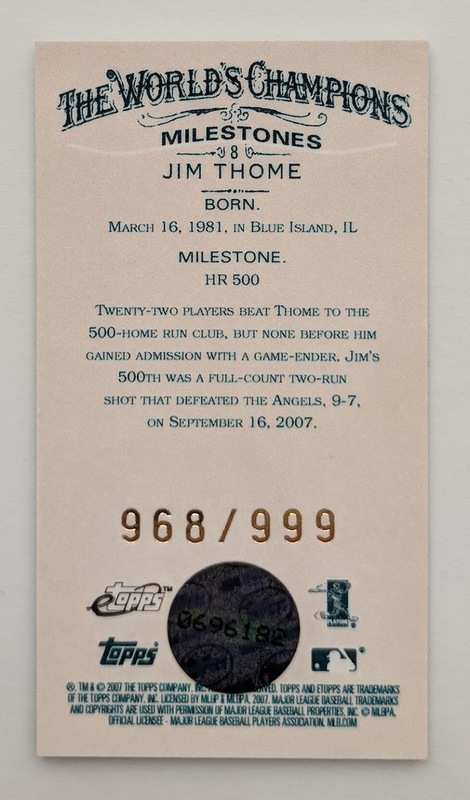 Between the time that I bought it and when I received it, Jim Thome was elected into the Hall of Fame, so that's pretty cool. I just bought my first mini magnetic one-touch for it to display it in style, I like it so much. The card celebrates his 500th home run. Numbered 968/999. 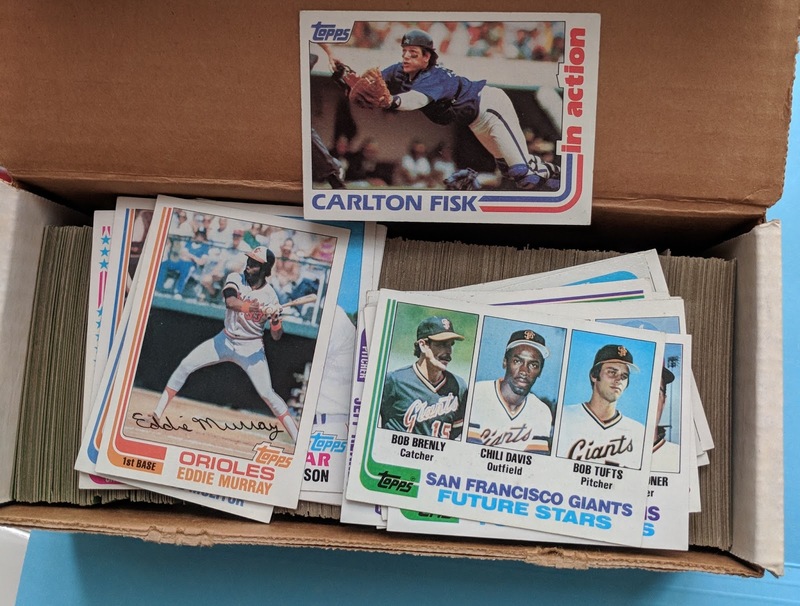 And with eTopps, you gotta figure a lot of that print run is sitting in a Topps warehouse forgotten about by the owners. Anyways, this shiny mini pairs nicely with the autograph I recently picked up as the best cards in my Thome PC. I was loading up my cart for an online order the other day and wasn't too far from the seller's "15% off your order" threshold. I did a search for Yaz and saw a newly listed 1960 Topps rookie for comfortably under the price of a blaster. Needless to say, I was all like "OMG Yaaaaassssss" and jumped at it. 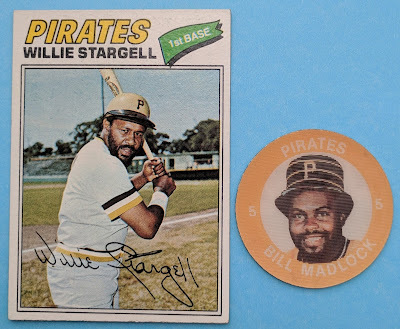 It's got rough corners and a crease around the brim, but I'm totally fine with that at such a great price ($13.31 after the 15% discount, with free shipping). 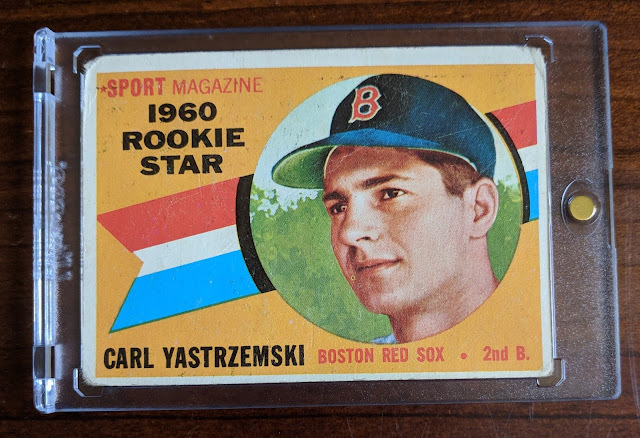 I've got a respectable Carl Yastrzemski PC, but this RC was a big need I had hoped to snag one day, so it's great to finally land it. 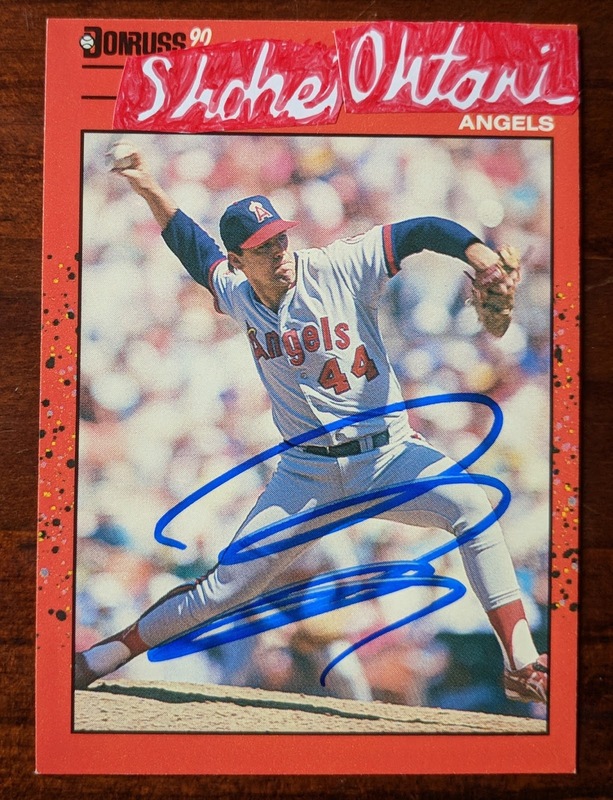 Props to Zippy Zappy for this Blog Bat Around idea: fielding a hypothetical team with your best autographs. To handicap myself (and make it easier), I'm only using my precious 2004 Retired refractors for this exercise. Outfield of Yaz, Yount, and Gwynn. Carew picking it at 1st. Boggs at the hot corner. Wizard and Ryne up the middle. Bench behind the plate and the Ryan Express on the mound. Seaver and Bob Gibson anchoring the rotation. Pen consists of Goose, Eck, and Rollie. I'd probably DH Ripken and use Dale Murphy as a pinch-hitter. 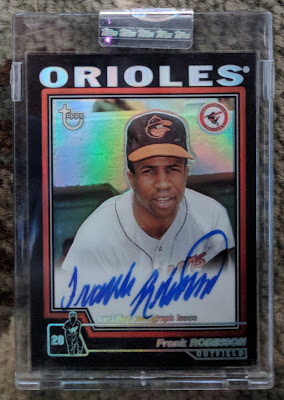 Almost forgot Frank Robinson! Let's make him player-manager.